Let us remember the exhortation of the Holy Father Pope Francis in this grace-filled season of lent. ‖The season of Lent during the Jubilee Year should also be lived more intensely as a privileged moment to celebrate and experience God‘s MERCY‖(MisericordiaeVultus,Pope Francis,no.17).It is in this context that the Holy Father calls us to the ―initiative of the 24 Hours for the Lord‖ ,which is to be celebrated on the Friday and Saturday preceding the Fourth week of Lent. I would like to invite all our Parishes to make this ―24 Hours for the Lord‖ to be organized with care and enthusiasm. Our faithful wait for our leadership in this regard. We have observed how they yearn to pray and observe vigils of prayer. 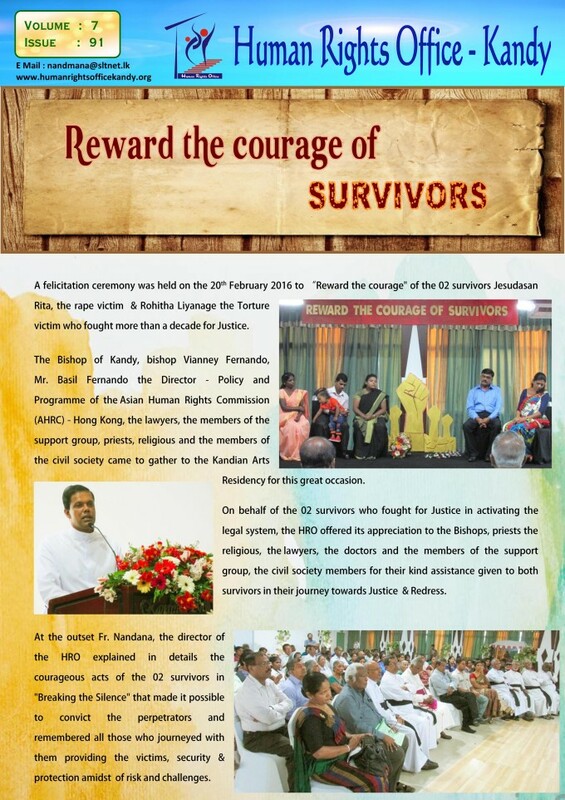 Therefore, under the guidance of the three Vicars Foranes of Kandy.Matale and NuwaraEliya, please organize the ―24 hours for the Lord‖ in every Parish ,making sure that there will be Priests to hear Confessions .One of the consoling phenomena of the Year of Mercy is that so many ,including ,young people are approaching the Sacrament of Reconciliation. Through this path so many are rediscovering a path back to the Lord. The Holy Father is pleading that we ―place the Sacrament of reconciliation at the centre once more, in such a way that it will enable our faithful to touch the grandeur of God‘s mercy with our own hands .For every penitent, it will be a source of true interior PEACE.‖MV,17). Our general meeting of Diocesan Pastoral Council on 13th of February discussed at length the YEAR OF MERCY and how it is to be celebrated in our Diocese. Practically all the Parishes were well represented and the lay participation in the discussions was very encouraging. Please obtain from your Parish council secretary, the resolutions for the Year of Mercy. 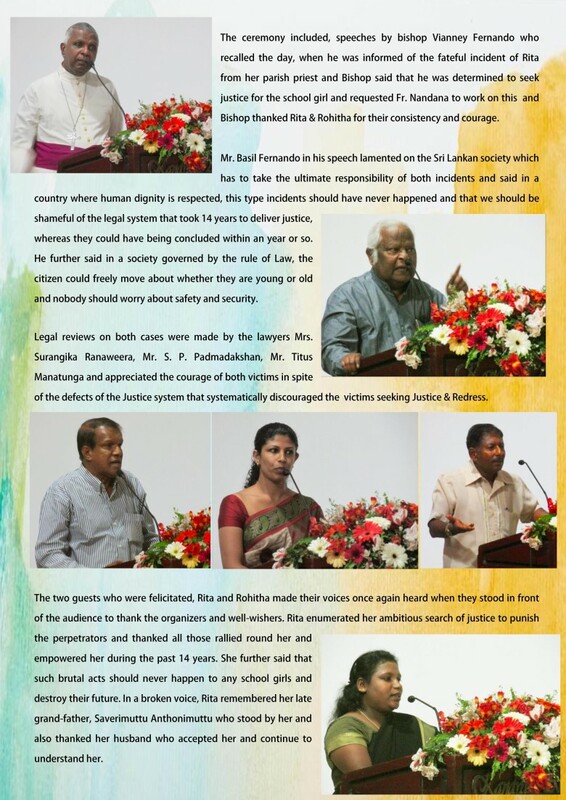 The complete report of the discussions will also be sent to you by Fr. Bala Rajendram. Let us continue to catechize and animate all our faithful continuously on the wonderful opportunity we have of bringing back those who have distanced themselves from the practice of Faith specially our scattered flock. The ―Holy Doors‖ and the pilgrimages to the Cathedral and designated Churches should be encouraged as our people need to experience God‘s mercy specially in the Sacrament of Reconciliation. But above all we, the shepherds, must be the first to experience God‘s mercy and love of the Father in our own lives. In our Parishes, the majority are poor people, struggling to live a decent life. We should be with them in their struggles. In the Year of Mercy, we need to do a lot of soul-searching as to how compassionate and merciful we are. Our model is Jesus, the High Priest, as we are configured to Christ by our priestly ordination. The Chrism Mass will be on the 22nd of March at Holy Cross Church, Hatton at 10.00 a.m. All our clergy, both Diocesan and Religious are expected to concelebrate the Chrism Mass and renew their Priestly Commitment. 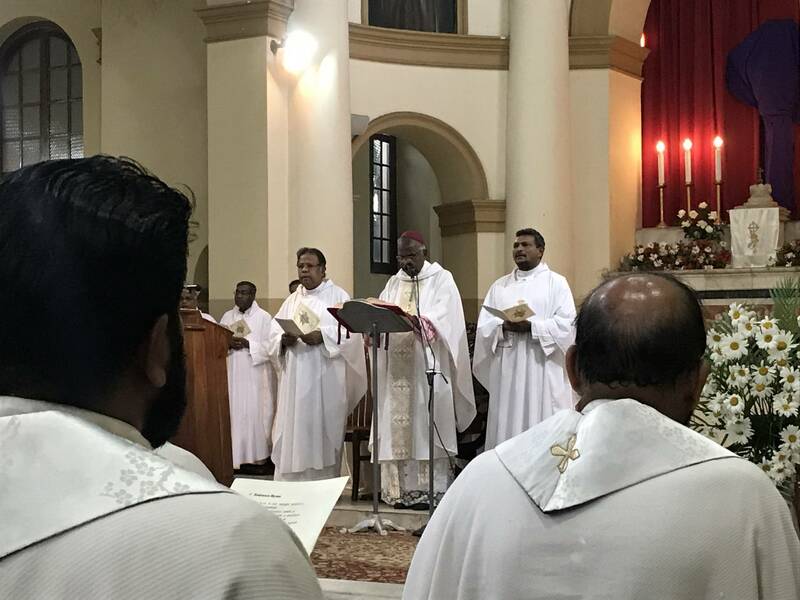 Bishop Vianney Fernando, Bishop of Kandy. NB: kindly inform the parish Priest those who wish to make pilgrimages to the Holy Door well ahead so that we can provide the necessary arrangements for confessions. Christians around the world mark the beginning of Lent with the celebration of Ash Wednesday. This ancient day and season has a surprising modern appeal. Priests and pastors often tell you that outside of Christmas, more people show up to church on Ash Wednesday than any other day of the year—including Easter. But this mystique isn‘t reserved for Christians alone. The customs that surround the season have a quality to them that transcend religion. So, if we‘re going to fast from anything this Lent, Francis suggests that even more than candy or alcohol, we fast from indifference towards others. But when we fast from this indifference, we can begin to feast on love. In fact, Lent is the perfect time to learn how to love again. Jesus—the great protagonist of this holy season—certainly showed us the way. In him, God descends all the way down to bring everyone up. In his life and his ministry, no one is excluded. ―What are you giving up for Lent?‖ It‘s a question a lot of people will get these next few days. If you want to change your body, perhaps alcohol and candy is the way to go. But if you want to change your heart, a harder fast is needed. This narrow road is gritty, but it isn‘t sterile. It will make room in ourselves to experience a love that can make us whole and set us free. Now that‘s something worth fasting for. The reform of Holy Week, with the Decree Maxima Redemptions Nostrae Mysteria (30 November 1955), established the faculty for the washing of feet of twelve men during the Mass of the Lord‘s Supper after the reading of the Gospel according to John, where a pastoral reason is given, in order to show in an almost representative way the humility and charity of Christ towards his disciples. In the Roman Liturgy this rite was handed down with the name of the Mandatum of the Lord concerning fraternal charity according to Jesus‘ word (cf. Jn 13:34), which are sung in an antiphon during the celebration. In performing this rite bishops and priests are invited to conform themselves intimately to Christ who ‗‗came not to be served but to serve‘‘ (Mt 20:28) and, compelled by charity (Jn 13:1), to give his life ‗‗to the end‘‘ for the salvation of the whole human race. A small group of the faithful to represent the variety and the unity of each part of the people of God. Such small groups can be made up of men and women, and it is appropriate that they consist of people young and old, healthy and sick, clerics, consecrated men and women and laity. The Congregation for Divine Worship and the Discipline of the Sacraments, in virtue of the faculties granted by the Supreme Pontiff, introduces this innovation into the liturgical books of the Roman Rite, reminding pastors of their responsibility to properly instruct both the chosen faithful as well as all others so that they may participate consciously, actively and fruitfully in the rite. Anything to the contrary not – withstanding. We know that Pope Francis has no difficulty speaking about the ‗‗sins of shepherds‘‘ – including himself and the Curia among them to a word such as ours in which ‗‗the meaning of sin‘‘ has been curtailed. However, if we look closely, his most emblematic phrase regarding shepherds, the one that has touched everyone‘s hearts, comes not from ‗‗ethics‘‘ , which is imposed in a restrictive fashion, but from ‗‗aesthetics‘‘ , which attracts irresistibly. Here is his famous phrase: I want a ‗‗priest who wears the smell of the sheep… but also smiles the smile of a father‘‘, as he stated on Holy Thursday 2015. This is the figure of the bishop that the Holy Father has at heart. The same goes for priests, cardinals and for the Pope himself: shepherds who not only insist on donning the sheep‘s wool, but who are ‗‗Passionate‘‘ about serving them. We see that it is more the odour than the figure of the bishop. An odour that, like many strong odours, ‗‗clearly‘‘ evokes many images, but the most important one, the one which must be read sine glossa, ‗‗without commentary‘‘, is without a doubt the image of shepherds who pasture their sheep, not themselves let‘s review a bit history. At the end of the young Jesuit Provincial of Argentina: he said- rather than ‗‗shepherds of the People of God‘‘ He also pointed out that, ‗‗when my conscience is isolated from the conscience of that portion of the faithful people of God whom I have to pasture, then it is time to ask ourselves what we want ‗to earn‘ What am I protecting with this isolation? Is it pastoral despotism? Is it a strange task which leads me to be a ‗shearer of sheep‘ instead of a shepherd? The pastoral reality is that of people who long for a religion that brings them closer to God, whose priest is a shepherd, not a tyrant or a refined man who is lost in the embellishments of fashion‘‘. He had other expressions, such as that of the Jesuit who must be ‗‗neither a mole nor a butterfly‘‘. But the image of the shearers of sheep aptly described the temptation of becoming decorative apostles who do not tend to their sheep or look for those who are lost, and it has made a lasting impression on many hearts. It might be helpful to say that they were not simply ‗‗rhetorical figures‘‘. During the formation received by some Jesuits, our Colegio Maximo took on new life as formation house, and the subject of sheep became a reality, both on the farm and in the apostolic work of the chapels. On the farm we bought sheep, cows and pigs, we restored beehives that had been left over from earlier times and we also grew a beautiful vegetable garden .We students dedicated ourselves to work and study, and the smell of the pigs literally made that of the sheep more pleasant. I remember a classmate who, while walking through the garden of Colegio Maximo, saw that Bergoglio, our rector, was helping to birth a lamb. My friend was surprised and offered to help. The sheep rejected one of the three lambs that she had birthed. Bergoglio thought for a moment and suddenly picked up that lamb and gave it to my classmate, saying: ‗‗Take care of it‘‘ ‗‗Go to the infirmary and warn up a little milk and give it to him by bottle‘‘ .For five months this student with the lamb in his room literally reeked of the odour of sheep! WHAT ARE YOU GIVING UP FOR LENT? Here it comes. THE question. The one that‘s gnawing at your insides and filling your quiet moments with fret. What are you giving up for Lent? Well, perhaps it‘s not as fretful to you as it is to me. If not, I‘m happy for you. I fret because I never know what to give up and usually end up changing my mind three or four times before I finally decide. What am I giving up for Lent? For me, giving up the usual stuff—sweets, favourite foods, television or movies, for example— doesn‘t work. I‘m already on a restricted diet (have been for years and years) and I watch very little TV and only an occasional movie. So, giving something up doesn‘t mean all that much to me, Lent-wise. Instead, I prefer to DO something that will effect a change in me, something that will move me toward the conversion that Christ asks of me. In that respect, I spend my Lents focusing on the doing rather than the not-doing and this Lent will be no different. The inspiration for observing Lent comes from Jesus‘ forty days in the desert, when he fasted, prayed, and resisted the temptations of the devil. This took place after he was baptized by John (Mt 3:13-17) and before he called his disciples and began his public ministry (Mt 4:12-25). Based on Jesus‘ example, I draw a parallel for myself in my own life. Like our Lord in the desert, I‘m between my Baptism and my ministry in the sense that every Lent should be for me a time to step back and prepare for the next segment of the mission God has given to me. For Lent, I go into the ―desert‖ in order to be cleansed of all that hinders me and strengthened for all that I must do. When I emerge from Lent, I should be ready to again take up my mission, but with deeper faith and in greater likeness of Christ. Every Lent, I must undergo a conversion from my old self to a new self who can better serve our Lord. The challenge is to do whatever will be most effective toward that goal. For me, giving something up has far less impact that taking on spiritual practices and devotions that will lead me toward real self-examination, re-evaluation, and renewal. That looks a bit different from year to year, depending on what‘s going on in my life and where I‘ve most gone astray. This year, I think the writing is on the wall—or on the door, as the case may be—since Pope Francis has proclaimed the Year of Mercy. By the Pope‘s actions, I‘m being called to become a more merciful person. By Christ‘s example, I‘m being called to live mercy in a very real way. Thus, one of the things I‘ve chosen to do for Lent is to pass through at least four Doors of Mercy between Ash Wednesday and Easter Sunday. God knows I have plenty of sins of my own for which I need those indulgences, but I also have plenty of folks I love who have passed away and need them as well. Aside from the indulgences themselves, I‘m sensing that I need the mercy—to both receive and give it—in order to effect a more substantial conversion in me. That‘s the biggie for this Lent, the main thing I‘ll do instead of giving something up. There will be others things as well, most of which is too private to share in a blog post. Regardless, the theme I‘ve set for myself for Lent 2016 is: Conversion of Mercy. I want to come out of Lent having experienced, and given, more mercy than I ever have before. So, now, let me ask you. What are you giving up for Lent? CATHOLIC JUBILEES DATE BACK TO YEAR 1300: EXTRA ORDINARY JUBILEE 1ST SINCE 1983 In St. Peter‘s basilica during the Communal Penance Service Pope Francis announced on March 13, the celebration on an ―extra ordinary holy year‖. This ―Jubilee of mercy ―has commenced with the opening of the Holy Door in. St. Peter‘s on the solemnity of the Immaculate Conception, 2015, and will conclude with the Solemnity of Our Lord Jesus Christ of the Universe. At the start of the New Year, the Holy Father had stated ―This is the time of mercy. It is important that the lay faithful live it and bring it into different social environments. Go forth!‖ The Jubilee announcement had been made on the second anniversary of the election of Pope Francis, during his homily for the Penitential Liturgy with which the Holy Father opened the ―24 hours for the lord‖. This initiative, proposed by the Pontifical Council for the Promotion of the New Evangelization, promotes throughout the world opening of churches for an extended period of time for the purpose of inviting people to the celebration of the Sacrament of Reconciliation. The theme for this year has been taken from the letter of St. Paul to the Ephesians, ―God being rich in mercy‖ (Eph 2:4). The opening of the next Jubilee will take place on the fiftieth anniversary of the closing of the Second Vatican council in 1965. This is of great significance, for it impels is the Church to continue the work began at Vatican ll. During the Jubilee, the Sunday reading for Ordinary time will be taken from the Gospel of Luke, the one referred to as‖ the evangelist of mercy‖. Dante Alighieri describes him as―scribamansuetudinis Christi,‖ ―narrator of the meekness of Christ‖. There are many well- known parables of mercy presented in the Gospel of Luke: the lost sheep, the lost coin and the merciful father. The official and the solemn announcement of the Holy Year will take place with the public proclamation of the Bollain front of the Holy Door on Divine Mercy Sunday, the feast instituted by Saint John Paul ll and celebrated on the Sunday after Easter. In the ancient Hebrew tradition, the Jubilee Year, which was celebrated every 50 years, was meant to restore equality among all of the children of Israel, offering new possibilities to families, which had lost their property and even their personal freedom. In addition, the Jubilee Year was a reminder to the rich that a time would come when their Israelites slaves would once again become their equals and would be able to reclaim their rights. ―Justice, according to the Law of Israel, consisted above all in the protection of the week‖ (St. John Paul ll ,Tertiomillenioadveniente13). The Catholic tradition of the Holy Year began with Pope Boniface VIII in 1300. Boniface VIII had envisioned a Jubilee every century. From 1475 onwards in- order to allow each generation to experience at least one holy year- the Extraordinary Jubilee may be announced on the occasion of an event of particular importance. 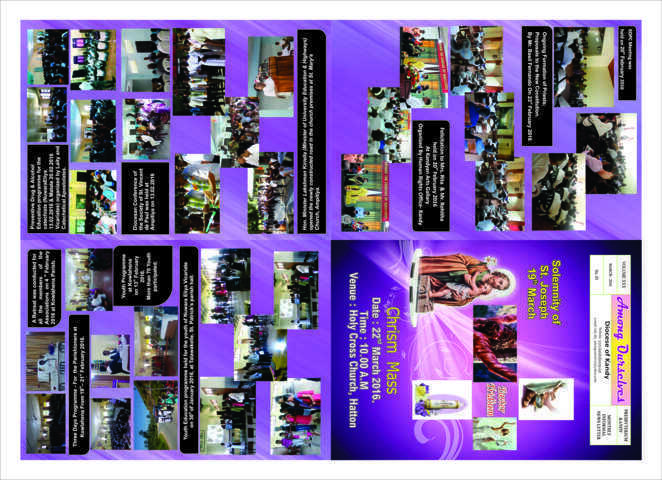 Until present, there have been 26 ordinary Holy Year celebrations, the last of which was the jubilee of 2000. The custom of calling extraordinary Jubilees dates back to the 16th century. The last extraordinary Holy Years, which were celebrated during the previous century, were those in 1933, proclaimed by Pius XI to celebrate 1900 Years of Redemption and in 1983, proclaimed by John Paul II on the occasion of the 1950 Year of Redemption. The Catholic Church has given to the Hebrew Jubilee a more spiritual significance. It consists in a general pardon, an indulgence open to all, and the possibility to renew one‘s relationship with God and neighbours. Thus, the Holy Year is always an opportunity to deepen one‘s faith and to live with a renewed commitment to Christian witness. With the Jubilee of Mercy, Pope Francis focuses attention upon the merciful God who invites all men and women to return to him. The encounter with god inspires in one virtue of mercy. The initial rite of the Jubilee is the opening of the Holy Door. This door is the one which is only opened during the Holy Year. Each of the four major Basilicas of Rome has a Holy Door: St. Peter‘s, St. John Lateran, and St. Paul outside the walls and St. Mary Major. This rite of the opening of the Holy Door illustrates symbolically the ides that, during the jubilee, the faithful are offered an ―extra- ordinary pathway‖ towards salvation. The Holy Doors of the other Basilicas will be opened after the opening of the Holy Door of St. Peter‘s Basilica. Mercy is the theme very dear to Pope Fancies, as is expressed in the Episcopal motto he had chosen “miserandoatqueeligendo”. This citation is taken from the homily of St. Bede the Venerable during which he commented on the Gospel passage of the calling of St. Mathew: “vidit ergo lesuspublicanum et quiamiserandoatqueeligendovidit, ait illisequere me” (Jesus therefore sees the tax collector, and since he sees by having mercy and by choosing, he says to him, ―follow me‘) this homily is a tribute to divine mercy. One possible translation of this motto is ―with eyes of mercy‖. During the first Angelus after his elections, the Holy Father stated: Feeling mercy, that this word changes everything. This is the best thing we can feel: it changes the world. A little mercy makes the world less cold and more just. We need to understand properly this mercy of God, this merciful Father who is so patient‖ (Angelus, March 17, 2013) In his Angelus on January 11, 2015, he stated: ―there is so much need of mercy today, and it is important that the lay faithful live it and bring it onto different social environments. Go forth! We are living in the age of mercy. Then, in his 2015 Lenten Message, the Holy Father expressed: ―how greatly I desire that all those places where the Church is present, specially our parishes and our communities may become islands of mercy in the midst of the sea of indifference!‖ In the English edition of the apostolic exhortation evangeli gaudium the term ‗mercy‘ appears 32 times. VATICAN ANNOUNCES OFFICIAL HYMN FOR THE YEAR OF MERCY by Kathy Schiffer The Vatican has just introduced the official hymn of the Holy Year of Mercy. The title is drawn from John 6:36, Misericordes sicut Pater (English: Be Merciful, As Your Father Is), by English composer Paul Inwood. Inwood’s composition was the winner in an international competition sponsored by the Pontifical Council for the Promotion of the New Evangelization. The hymn has now been released in Italian, French, and English, with a Latin antiphon and refrains. Archbishop Rino Fisichella, first Prefect of the Pontifical Council for the Promotion of the New Evangelization, explained in a press conference that the Year of Mercy is intended as an opportunity for the faithful to meet people’s ―real needs‖ with concrete assistance, to experience a ―true pilgrimage‖ on foot, and to send ―missionaries of mercy‖ throughout the world to show forgiveness for even the most serious of sins. Let us give thanks to the Son, Light of the nations in aeternum mercy eius He loved us with a heart of flesh [from John 15:12] in aeternum mercy eius we receive from Him, to Him we give ourselves in aeternum mercy eius the heart to open to those who hunger and thirst [from Matthew 25,31ss] in aeternum mercy eius Misericordes sicut Pater! Misericordes sicut Pater! We call for peace to the God of all peace in aeternum mercy eius the earth awaits the gospel of the Kingdom [from Matthew 24,14] in aeternum mercy eius grace and joy to those who love and forgive in aeternum mercy eius will be the new heavens and the earth [from Revelation 21.1] in aeternum mercy eius Misericordes sicut Pater! No need to throw out the chocolate, booze, and carbs. Pope Francis has a different idea for fasting this year. Christians around the world mark the beginning of Lent with the celebration of Ash Wednesday. This ancient day and season has a surprising modern appeal. Priests and pastors often tell you that outside of Christmas, more people show up to church on Ash Wednesday than any other day of the year—including Easter. But this mystique isn‘t reserved for Christians alone. The customs that surround the season have a quality to them that transcend religion. MORE Pope to New Cardinals: Practice Compassion, Be Open to All But when we fast from this indifference, we can begin to feast on love. In fact, Lent is the perfect time to learn how to love again. Jesus—the great protagonist of this holy season—certainly showed us the way. In him, God descends all the way down to bring everyone up. In his life and his ministry, no one is excluded. ―What are you giving up for Lent?‖ It‘s a question a lot of people will get these next few days. If you want to change your body, perhaps alcohol and candy is the way to go. But if you want to change your heart, a harder fast is needed. This narrow road is gritty, but it isn‘t sterile. It will make room in ourselves to experience a love that can make us whole and set us free. Now that‘s something worth fasting for. The Pope said this today before praying the midday Angelus with those gathered in St. Peter‘s Square. Drawing from the Gospel of today‘s Mass, in which Jesus corrects the idea that God punishes sin with tragedies, the Holy Father said that we have to examine our idea of God and our own presumptions about ourselves. ―Today too, seeing certain disgraces and sorrowful happenings, we can have the temptation to ‗unload‘ the responsibility on the victims, or even on God himself. But the Gospel invites us to reflect: What idea of God do we have? Are we truly convinced that God is like that, or isn‘t that just our projection, a God made to ‗our image and likeness?‘‖ he said. 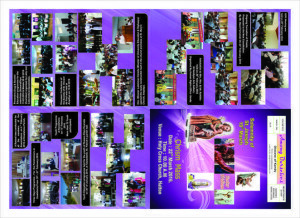 Immediately after short refreshment served, the gathering was addressed by His Lordship on the theme, “Consecrated Life in the service of Evangelization of the Poor”. It was an invitation to live a life of witnessing that would empower the laity to love the person of Jesus Christ. The gathering was divided into eight groups for discussion on five questions relevant to the theme that was addressed. One from each group was called to the stage for the main concept that was highly spoken in that particular group. Then all took part in the lunch that was arranged by Rev. Fr. 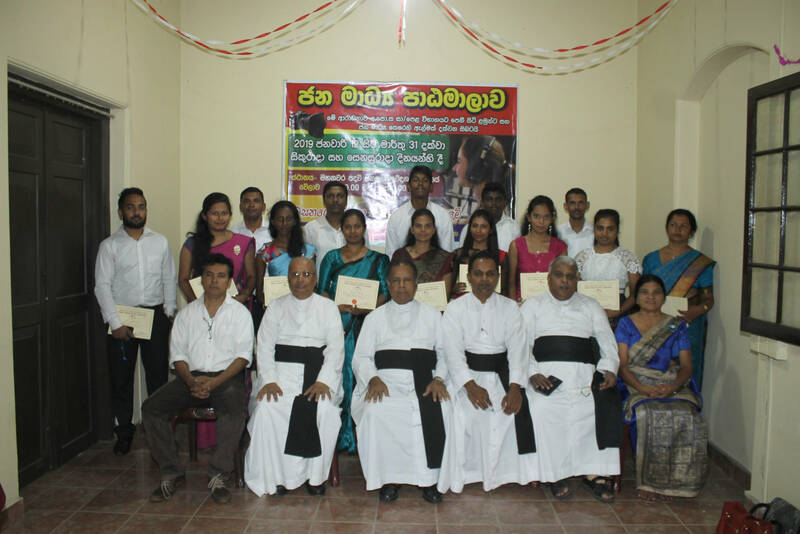 Milroy Fonseka, the Vicar General for all at the refectory of the Cathedral at 12:45 p.m. after the lunch the priests and sisters gathered again at the Cathedral hall for the time of fellowship. There were some fellowship games, in which all the members took part happily. The gathering also listened to the melodious voice of our chief Shepherd. The vote of thanks was delivered by Rev.Fr. Devin and our bishop thanked the whole organizing committee for making the day a successful one. A Summary of the Suggestions of the Group Discussion Question No 1: What have I gained from the: Year of Consecrated Life” that we have travelled? Answers: Deepening of prayer life; Awareness of the presence of Religious Life; Going back to the Charism; Realizing one’s call to holiness; understanding the value of consecrated life; experiencing the God as a person; gaining inner peace and joy; closeness to the Eucharistic Lord; reflection from the life of Holy Father; and Gaining more attention to our own spirituality. Question No 2: what are the concrete resolutions we can make as individuals and communities to evangelize the poor among us? Answers: Visiting the families in the parish; availability for the needy; helping the poor to stand on their own; organizing educational and skill developing programmes; discovering Christ in everyone; love and care to the own community members; respect each one; and spiritual feeding of the poor. Question No 3: How can we witness the Gospel values to the World through the Consecrated Life? Answers: live the community life with love; individual and collective witnessing; forgiving one another; rooted in prayer life; deep experience of God and the sharing of such experience. Question Nos 4 & 5: What are the challenges we are facing in living the Gospel in a radical way as consecrated men and women? What are the difficulties we face evangelizing the poor in our apostolate? Answers: challenged by worldliness; becoming victims to the business; lack of proper use of technology in a creative way; dangers of compromising, secularization, individualism, ziber civilisation, modernization, Self-centeredness, lack of zeal and interest; lack of understanding of evangelization, no much interaction with the poor, and lack of resources. Thanks for all who actively involved in the discussion.